A variety of optional equipment is available for the MicroStat®. Wall mounting the MicroStat or Unistat is simple with this basic bracket. any MSL light module. These surface mount printed circuit board lamp simulators represent the state of the art in LED technology. MSLED modules are UL Listed. Some applications require that the status indicators be raised above the machine surface. Using powder coated steel helps improve the visibility of the MicroStat or Unistat. Three different lengths are available for the MicroStat or Unistat. They measure 4-inches (MSP-4), 16-inches (MSP-16) and 32-inches (MSP-32). Adding sound to the MicroStat is simple with the plug-in Sound Module. The Sound Module produces 83-85 dBa @ 10'. 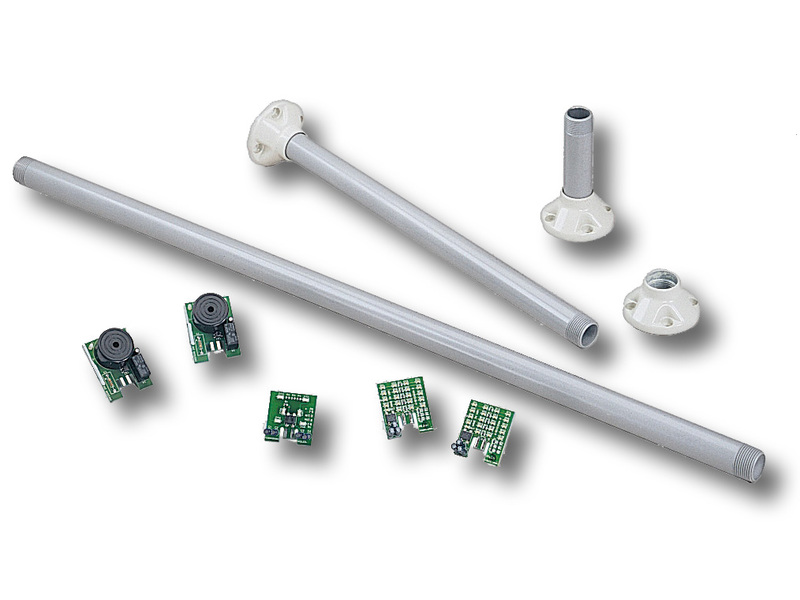 This compact piezo device replaces the lamp in the top position of any MicroStat. A slotted opaque lens protects the sound module circuit and permits the sound to be heard at maximum levels. Adding the sound module to the MicroStat changes the Type rating from 4X to Type 1. Sound modules are available in 24VDC and 120VAC operating voltages. The MicroStat or Unistat base can be pipe-mounted or surface-mounted. When using the pipe extensions the Tulip Base is required for a true surface mount. Flashers for the MicroStat are available in 24VDC and 120VAC. Each flash at 75 fpm.